By now, you are probably familiar with Mr. Brainwash, the controversial hot topic that has the art world scratching their heads and opening up their checkbooks. As the anticipation loomed over his overly ambitious "Art Show 2011," the man exemplified the scatter-brained character we came to know him as in the Oscar-nominated documentary, "Exit Through The Gift Shop." The line for the opening night curled around the block on both sides as people waited frantically not only to get in, but to secure their limited edition, autographed poster, courtesy of the artist. As soon as doors opened, a mob of enthusiastic street art fans rushed in to absorb the 80,000 square-foot space; at least that's what I thought their intentions were. Long story short, the limited edition posters were not ready and when people caught wind of this truth, it unfortunately became a defining moment of the evening. The artwork was, well, exactly what you would expect. Familiar icons appropriated onto every canvas imaginable, large scale sculptures of Greek gods wielding paint rollers, everything grandiose and to the point. The more intriguing aspects of the show came in the form of eerily lit rooms transformed into vaguely hallucinogenic scenes, reminiscent of some dilapidated elementary school possessed by a poltergeist. In addition, Mr. Brainwash, previously covered on the Huffington Post, invited anyone to put up their own artwork, as a sort of unifying gesture for the community. It brought a certain amount of authenticity to the over-the-top show. There were several instances of fans initiating conversation with the artist, not to pat him on the back, but to complain about the posters that were not in their hands. The irony of people waiting in line for hours for a product that was not quite ready and complaining to the very person responsible for their rabid fandom was pretty surreal. Wasn't there an art show going on somewhere around here? 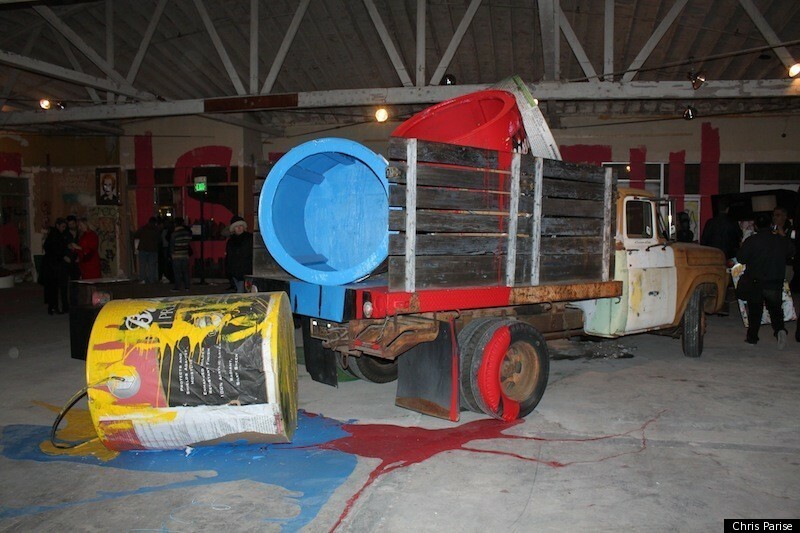 Aside from that debacle, Brainwash was still in the process of putting the show together, after it had already opened. As he threw stuffed animals onto a giant Mike Kelley-esque mountain, press were snapping away. It is unusual for an artist to so blatantly flesh out their ideas in front of an audience, unless the performance was the final product. On the one hand, you could say that Mr. Brainwash was frantically running around, putting the finishing touches on four floors filled with work, but alternatively you could say that it was all part of the plan. Frankly, I am still scratching my head and will be for a very long time. Watch our interview with Mr. Brainwash at the event below.